To Vikings Jazz Mall Makati Facebook Fans, here's a special discount for you! 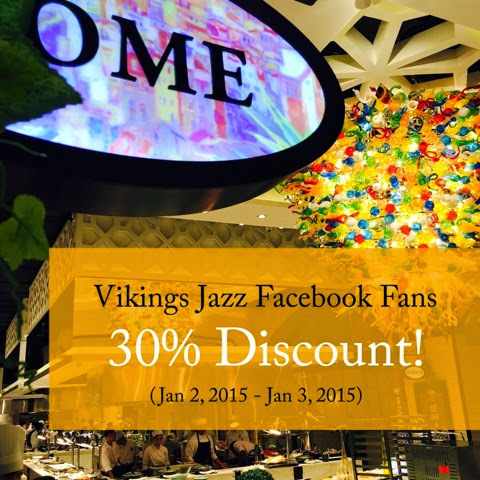 1) The Facebook fans of Vikings Jazz Mall Makati are entitled to a 30% discount, whether paying in cash or card. 2) Guest must present to their staff that he/she has indeed “Liked” our Facebook page either through the guest’s smartphones or on one of the branch’s iPad. 3) This discount is only available between January 2, 2015 - January 3, 2015. 4) This discount can’t be used in conjunction with in-house promotions or discounts. 5) This discount is available on a per pax/individual basis. 6) This discount can only be used in Vikings Jazz Mall Makati branch. Location: SM Jazz Mall, Metropolitan Avenue Cor. Nicanor Garcia St.